Ratzenberger’s first order as new pope was to select the name by which he will be identified in the chronicles of the Catholic Church. In front of an exuberant crowd of 10,000 Bostonians chanting 'Cliffie! Cliffie!' and some 8,000 choirboys angrily shouting 'Stiffy! Stiffy! 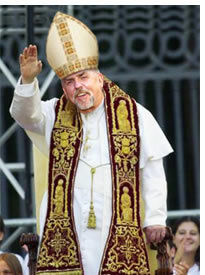 the Cardinal Archbishop of New York, Roger Mee, officially declared Ratzenberger Pope Clavin I. But the representatives of the Conclave were resolute in their decision, as Catholic dogma allows for only the strictest interpretation of the ballots. Only the man whose name is selected on two thirds or more of all the ballots cast is eligible to be named pope. As such, Benedict was forced to hand over his custom-made, white pointy hat and the keys to the popemobile to the man known the world over as Cliff Clavin. As a consolation, Benedict was told that should Clavin, who turned fifty-eight, just four days after John Paul’s death, die in his lifetime, or for any other reason be unable to fulfill his duties as the representative of God on earth, the popedom would be his. However, such an event is considered extremely unlikely, having only occurred once in the Church’s 2,000 year history in 858, when 'Pope Joan'—a drop-dead gorgeous Englishwoman who disguised herself as a monk to be with her cleric boyfriend—went to Rome. There, she so impressed the Cardinals with her credentials that she was elected pope. Unfortunately, her secret was discovered when a bouncing bun popped out of her bulging oven during a procession, whereupon she was unfrocked—or possibly stripped to her undies—before being soundly scourged, racked, broken on the wheel and bricked up alive with her nipper in a nearby convent wall. Although the world’s Cardinals agreed that Benedict’s less than sporting response to his dismissal was rather undignified, they have forgiven him on the grounds that such unpopely behaviour is not sufficient cause for stripping a Cardinal of his feathers. According to sources close to—and often directly underneath—previous popes, dismissal is one of only three things that truly pisses off a pope (and Vatican experts insist that child molestation is not one of them). 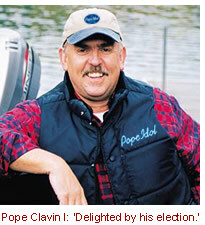 Now that Cliff Clavin is the Pope, having unleashed dogs on rural routes is destined to become a mortal sin. The only hope to restore the Popedom to Benedict is for the vote count to be overturned, forcing a new election; a scenario being pursued by some black Cardinals who claim the elections 'butterfly ballots' confused many into voting for a white man by mistake.